A lovely amigurumi bear wearing a chunky scarf with pompoms. We’ve got two versions of the bear, a white one and a brown one and each wearing a different stripy scarf. You can choose to copy these versions or indulge your whims and mix up other combinations. 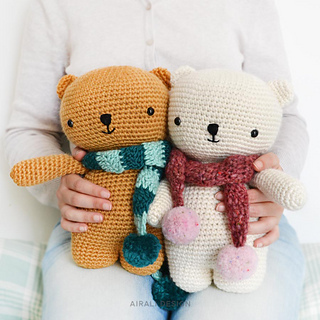 It’s a free crochet / amigurumi pattern by Airali design using Dyeing House Gallery yarn.